A blind Filipino woman received a standing ovation and made one of the judges cry during her audition in the latest season of "France's Got Talent". Alienette Coldfire, whose real name is Katchry Jewel Golbin, chose to sing the French version of the "Les Miserables" piece "I Dreamed A Dream" for her audition, which was aired on Tuesday. 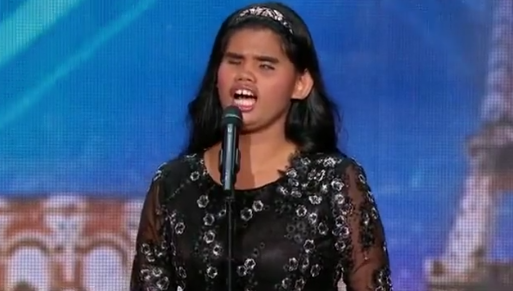 Her beautiful and emotional rendition of the song swept the judges off their feet, with one of them reduced to tears. The judges then gave her their nods to send her to the next round of the competition. When asked how she learned French, Coldfire, who hails from Capiz, said her friends taught her the language for about three years. "I learned with my friends through the Internet," she said. "When I heard Edith Piaf's 'La Vie en rose,' I wanted to understand the lyrics. That's how I learned French." The 25-year-old Pinay also said that she joined the competition to prove that physical impairment is not a hindrance for anyone to do great things.